Opening scene. Felix O' Kelly buries the money under the floorboards of the motel room. Darlene Sweet and Father Daniel Flynn arrive at the El Royale. 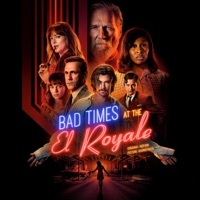 Broadbeck discovers Miles' heroin addiction while investigating the El Royale. Flashback to Darlene's old singing job. First song that plays while Darlene and Father Flynn eat and talk. Second song that plays while Darlene and Father Flynn eat and talk. Third song that plays while Darlene and Father Flynn eat and talk. Rose balances on the California/Nevada border; Emily interrogates Miles. Billy Lee and his followers arrive at the El Royale. Song from the official trailer. what song is the artist and song played in the closing credits? the song billy lee dances to? What song is Darlene Singing at the end?